Shibani DandekarRochelle Rao in an Indian model and anchor. She was crowned Femina Miss India International in 2012. Rao was a co-anchor in the sixth edition of the IPL. She has hosted many TV shows and will soon make her debut as a Bollywood actress under a big banner. Karishma KotakShibani Dandekar is an Indian singer, anchor and model. She featured as a co-anchor in the fourth edition of the IPL. She has even anchored the finals of the Celebrity Cricket League (CCL). She is part of a band named DMajor with her sisters Anusha and Apeksha. In 2012, she was a contestant in the dancing show Jhalak Dikhhla Jaa 5. She has anchored various other TV shows too. Karishma Kotak is a British Indian m knowodel, actress and TV presenter. She was a contestant in Big Boss 6. Karishma has acted in a few music videos, including one in 2004 called ‘Me Against Myself’ by British singer-songwriter Jay Sean. She was a co-anchor in the sixth edition of the IPL. Saumya Tandon is an Indian actress. She co-hosted Zor Ka Jhatka: Total Wipeout (based on the Wipeout format) with Shah Rukh Khan in 2011. Wipeout is a water sport game show. Mandira Bedi is a renowned Indian celebrity who acted as a television presenter in the 2003 and 2007 Cricket World Cups. An Aries, she is passionate about live cricket and was thrilled when Sony Television offered her to compere “Extra Innings” for the 2007 Cricket World Cup. Her appearance in a wide array of designer sarees glamorized the drab male-dominated cricket world which eventually led to a rise in viewership. She even hosted the coverage of the 2010 Indian Premier League cricket on British channel ITV in March. Mandira was first spotted in the 1994 serial Shanti, were she played the lead role. Trying to recall this flawless beauty? She recently won the reality show “Dil Jeetegi Desi Girl”. She started her career by hosting “Fourth Umpire” – the pre and post-match cricket show on Doordarshan. In the show she was seen debating on various cricketing issues with cricket experts like Charu Sharma, Mohinder Amarnath, etc. The attractive and vivacious model-turned-actor has also worked in the popular TV serial Kasam Se. Despite playing a negative role in the show, it made her popular among the masses. She has even worked in Vikram Bhatt’s thriller movie Phirr. Archana hails from Hyderabad and is one of the most remarkable television show hosts in the country. Nothing sells like cricket in India, and it was no surprise when she quit her job as a VJ on Channel [V] and signed up with Neo Sports, which has the right to telecast all international cricket matches in India. She hosts ‘Tour Diary for Extra Cover’, which is a pre-match show on Neo Sports, and ‘Cricket…Tadka Marke’, which focuses on the game’s crazy fans, gossip about cricketers, fun trivia and other happenings in the world of cricket. The peppy Archana even hosts ‘Vaseline Men Once More’, where one can request for one’s favourite cricket moment. Shonali is one of the hosts on the ICC World T20 pre-match show along with Cyrus Broacha. She had earlier hosted the Indian Premier league – in the first edition of the tournament – from the cricket grounds. Shonali has won the Miss India International (2003) pageant. She was one of the Top 5 participants at the Femina Miss India pageant and was a runner up in Miss International (2003). She has even hosted “Popcorn” on Zoom TV and “Great Indian laughter Challenge” on Star One. Her other work includes being co-host of the 2010 T20 World Cup show on ESPN-Star Sports, Extra Innings T20 on MAX for the DLF IPL T20 Tournament. She has also acted as a presenter during the cricket World Cup matches in South Africa. Mayanti Langer is an Indian TV sports journalist with ESPN. Since her childhood she was inclined towards football. When in college she became a guest anchor for the broadcast of FIFA beach football. 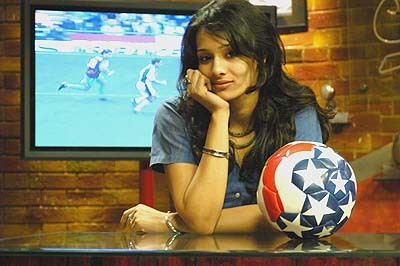 With the success of the broadcast she was offered a spot as host and associate producer for Football Café on Zee sports. Langer eventually worked for various football shows on the Zee network, providing commentary and interviews during pre-match, half-time and post-match shows. She was also the anchor on Zee Sports for the Nehru Cup held in New Delhi. Langer was the host of the 2010 FIFA World Cup broadcast on ESPN alongside John Dykes which included pre-match, half-match and post-match analysis and attracted millions of viewers. Lekha Washington is a qualified film-maker from NID, Ahemdabad. Lekha began her career as a theatre artist. In 2006 she became a VJ on SS Music, and hosted the popular show ‘PCO’ and later, ‘Connect’. She anchored the first IPL telecast on Sony TV. Washington subsequently went on to host Canadian 20/20 matches on international television. She became famous just two months later when she hosted the IPL season one along with Ajay Jadeja. Although Lekha has acted in a couple of Tamil flicks – Kettayan and Jayamkondaan, she has always wanted to be a Bollywood star and the IPL gig has helped her.